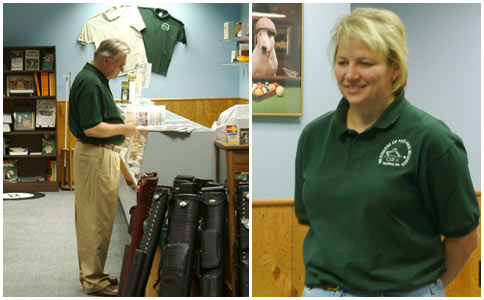 Cue U Billiard instruction and Pool instructor classes and costs with Cue-U the College of Pool and Billiards! 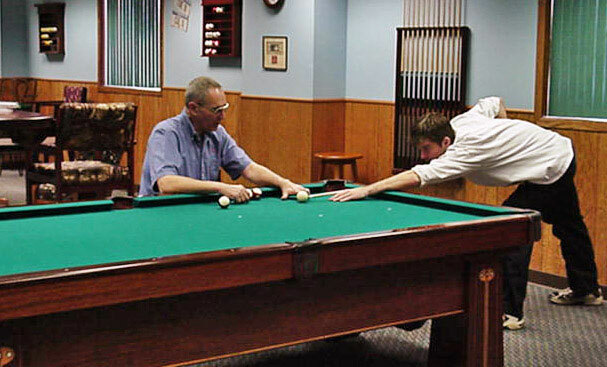 While a student at Cue U, the College of Pool and Billiards, you will receive the finest one-on-one billiard instruction available. At the Cue U pool school, trained pool instructors will help you with every shot, and answer every question during your stay. Our large staff of certified instructors assures that you will receive the widest possible range of input on each of the pool subjects covered during your personal pool training. A college environment is maintained at the Cue U pool school, and custom textbooks are provided for each pool student. The pool instruction time is divided between classroom presentations and personal pool training with experiments and practice on the rare antique tables in the pool school. The complete range of pool clinics and billiard workshops in each Cue U pool class is designed to improve the skill level of every player. The schedule of pool workshops in each Cue U pool class is prescribed, but the time spent on each pool workshop varies substantially depending on the needs of each individual pool student. The emphasis on one-on-one instruction at the Cue U pool school assures maximum improvement for each student. The available pool classes are described below. All of the pool classes are available in the personalized one-day pool clinic format. Tuition for each one-day pool class is $495.00 per person. The one-day pool classes are scheduled on Tuesdays or Wednesdays and are usually one-on-one where a single student works with one or two of the Cue U trained pool instructors in an intensive, personal learning environment. Additional one-day classes can be held on consecutive days for students who wish to attend for two or three days. Each day at the Cue U pool school starts at 10 a.m. and ends about 5 p.m. Pool instructors and the students take a lunch break at a nearby restaurant, where they can review the morning pool training session. Practice periods are provided between pool clinics so the Cue U pool instructors can assure that each pool student has understood the pool course material. Class sizes at the Cue U pool school are always as small as possible to maximize attention to each individual pool student. We always have at least a one-on-one instructor-student ratio, and sometimes the ratio is two or even three pool instructors per pool student! The Cue U pool clinics and pool courses are certified by the Professional Billiard Instructor Association and the Billiard Congress of America. Cue U is also the official pool school of the American Cuemakers Association. The Cue U pool classes are numbered One, Two and Three, but that is not to imply that they are "Beginner, Intermediate and Advanced". The information presented in the Cue U Two pool class is an extension of the pool training offered in Cue U One pool class, and Cue U Three pool class is a further extension of the pool training offered in both of the previous pool courses. As a result, it is not possible for students to skip a pool class or to take them out of sequence. Pool cue movement and alignment. Video analysis and individual pool drills to enhance pool performance and consistency. Emphasis on shot mechanics and precision cue ball control. Pool workshops on consistency, shotmaking and effective break shots. How to improve the mental game. Pool cue ball control and position play. Elements of applicable pool physics and geometry. Applying vertical and horizontal spin to the cue ball. Pool workshops and clinics on speed control, position play and safety techniques. How to win with good runout strategy. Winning pool shots and techniques. How to win with carom shots, billiard shots and gear shots. How to turn a bad situation into a runout. Pool workshops on kick shots, bank shots, gear and pinch shots. For pool students who are not yet ready to commit to a full pool course, the Cue U pool school offers a two-hour Stroke Evaluation workshop. In addition to being a valuable learning experience, it allows a prospective student to receive an introduction to the Cue U pool instructors and their methods of pool instruction before enrolling in a full pool course. The Stroke Evaluation workshop gives you valuable assistance with improving your pool game and also provides a chance for you to see what we do and how we do it. The cost is $150.00 and you receive a discount on the tuition for the full Cue U pool class if you enroll within 90 days after the Stroke Evaluation workshop. The personal video analysis in the Stroke Evaluation workshop serves as an introduction to the College of Pool and Billiards and its pool instructors. The in-depth examination of your current mechanical strengths and weaknesses provides immediate improvement to your pool game and at the same time shows you the advantage of the training at the Cue U billiard academy. Available to previous students who want additional help with specific areas of their pool game. A three hour comprehensive review of your personal strengths and weaknesses with extensive video analysis. Consistency and game position problems are addressed as necessary and specific drills are developed to help remedy any deficiency. The $300.00 tuition provides an immediate path to improvement. Enrollment in the Refresher Course is open to any previous student at the Cue U pool school.